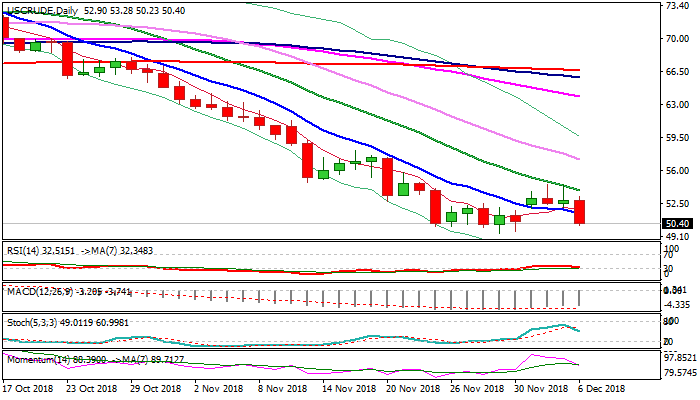 WTI oil fell on Thursday, reversing so far the largest part of recent $49.40/$54.54 recovery rally, driven lower by slide in stock market and uncertainty about the outcome of OPEC meeting. The cartel announced the readiness to cut the output (between 1 and 1.4 mln bpd, but awaiting decision from Russia. Optimistic tone prevails on expectations for Russian decision on Friday, as the amount of reduction would also depend on Russian contribution and decision about how the cut will be distributed would signal the size of total reduction (1 – 1.4 mln bpd). 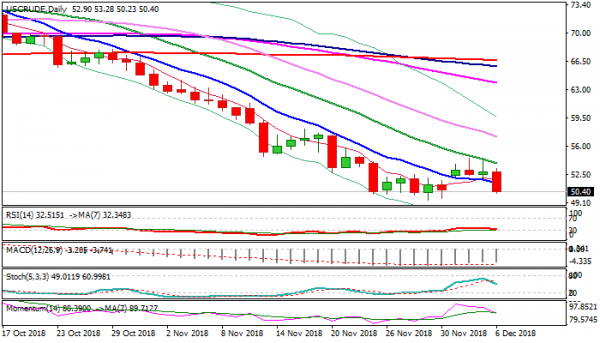 On the other side, the decision for reduced output faces strong opposition from the US President Trump, who favors lower oil prices and has already put pressure on Saudi Arabia. Today’s fall was signaled by double upside rejection at $54.50 zone (Tue/Wed) and helped by strong negative momentum. Immediate risk is seen for retest of psychological $50 support, dented on spikes to $49.64/40 last week, but without close below, which keeps the support valid. Sustained break below $50 pivot would signal continuation of larger downtrend (oil price was down 34% since early Oct) which could extend towards Fibo support at $45.46 (61.8% of $26.04/$76.88 ascend). Conversely, bullish scenario requires sustained break above falling 20SMA ($53.91) to signal recovery.